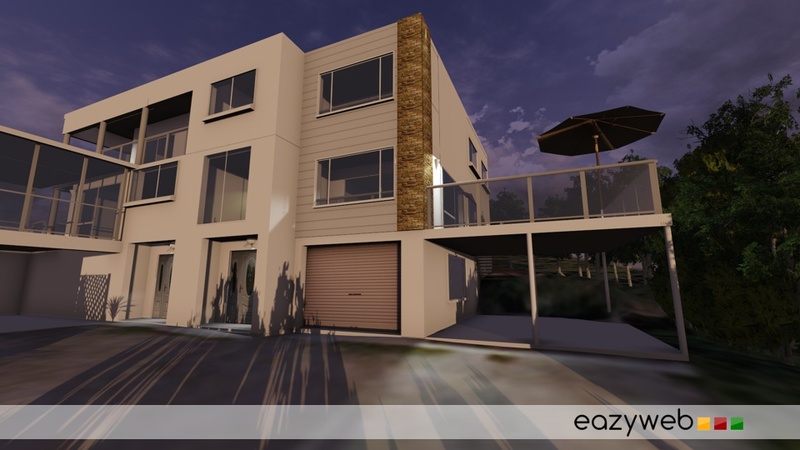 Eazyweb were commissioned to produce an accurate 3D model of a large 3 storey house, and output in real-time for the client to visualise the proposed building extension works. During the modelling stage, Google Earth was used to ensure the accurate geographic placement and orientation of the model. This allowed us to accurately show the client the context of the house and the new proposed extensions. Utilising a geographically-accurate location also allowed us to demonstrate basic ‘sun studies’ to the client, to allow them to visualise the amount and location of shadowing on the surrounding plot, following the building development. Once the basic model had been signed off with the client, we then added the creative design elements, the doors and windows, and the surrounding vegetation on the plot. High quality rendered print outputs were delivered as part of the project, together with a simple construction animation showing the building being built. The project was also delivered with a stand-alone interactive realtime viewer, allowing the client to walk around and see the proposed works from all angles, in full rendered 3D.